Republican Gov. 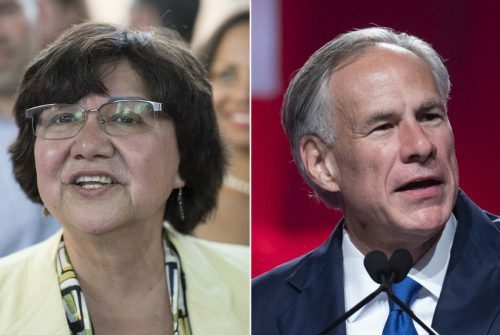 Greg Abbott and his Democratic challenger, former Dallas County Sheriff Lupe Valdez, have agreed — to a point — to debate at least once this fall. And if the event comes off as proposed on Sept. 28, there will be some stiff competition: Friday night football and the first day of the State Fair of Texas. The debate was announced late Wednesday afternoon by the TV station chain Nexstar. The Irving-based company owns stations in small cities and towns across Texas, from Wichita Falls to Waco, from Tyler to El Paso. Its only big-city station is KXAN, the NBC station in Austin. The campaign said the debate will also air on partner stations in Dallas, Houston and San Antonio. On Thursday morning, the Valdez campaign told KERA that it’s still negotiating on a location and date. She wants to avoid Friday nights and thinks the debate shouldn’t be held on either candidate’s home turf. The campaign did not lay out a preferred time and place for a debate. The Dallas Morning News points out that Abbott’s strategy might mirror former Gov. Rick Perry’s in 2006. The Republican who’s now U.S. Energy Secretary accepted only one debate invitation that year, and faced a Democrat and two independents in a head-to-head matchup with Friday night high school football. This entry was posted in KRTS News, KXWT News and tagged Greg Abbott, Lupe Valdez, Texas Governor's Race. Bookmark the permalink.